The HTC One’s “Ultrapixel” camera is one of its main selling points, as is the vast assortment of photo and video features dedicated to photo/video taking and sharing with friends. Instead of boring your friends with a typical gallery, how about showing them a video highlight instead? One of the more interesting HTC One features is its new Ultrapixel camera, a stark difference from the 8MP shooter on its previous flagship devices, and also different from the Samsung Galaxy S4 or Sony Xperia Z 13MP camera. The resolution of the Ultrapixel is only 4MP, which may confuse customers who are accustomed to more the merrier. The megapixel race isn’t always the key to better pictures, but no thanks to marketing spiel, it has been an easy statistic to roll of a salesman tongue when it comes to highlighting improvements. This article in 2011 “Why we’ve reached the end of the camera megapixel race” helps explain more of this issue. HTC had explained the HTC One camera in great detail. They have claims that the camera sensor allows users to shoot better images in low-light environments as one of the main components of this new Ultrapixel camera. Another is the natural color tone. The key difference in this camera is the sensor size. Would 4MP be enough? Well if you are sending it for print, thats decent enough for a 6-8R size photo. That should be enough for most mobile photographers. In comparison to the other typical mobile shooters, the HTC One ultrapixel camera has actually the same sensor size as their 13MP competitors. 1/3.2-inch is what HTC used in the One and the same size is also present on the iPhone 5, Galaxy S III, or Lumia 920. 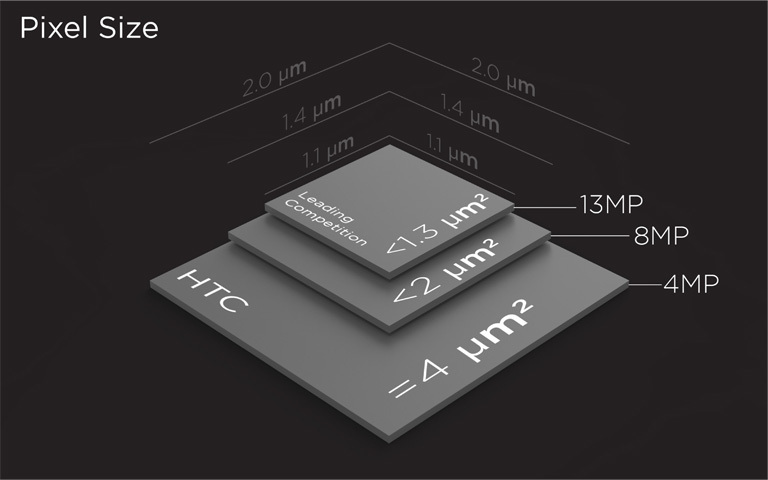 However, HTC only squeeze four-megapixels from that sensor. Having less pixels per the same surface, HTC’s pixels are larger, and would allow for better light sensitivity. In exchange, HTC sacrificed image size, going for “less detailed” output but for better image quality. One area where it loses out is in terms of image detail, a 13MP pixel camera would be able to zoom in to small details such as the license plate of a car, but this may not be possible on the HTC One. Another area is in zoom. Phone cameras have to rely on digital zoom, and a “3X” digital zoom on a 13mp camera would provide the same image quality as the HTC One. If you do the same on the HTC One, the image resolution drops quite a fair bit to about 1.3 MP. Beyond just the UltraPixel improvement, the camera is also equipped with F/2.0 Aperture and Optical Image Stabilization (OIS) to help take better pictures and videos. To me, I often use a mobile phone camera in indoor situations and that would be where the HTC One shines. In our tests, the UltraPixel camera took photos about as well as other smartphones in situations outdoors with plenty of light. In low light, the camera did do a better job producing a brighter image if put in night mode. Another unique feature about the HTC One’s camera is that it shoots 3-second videos that the company calls HTC Zoes. I thought this feature, which appears to be inspired by Twitter’s Vine app, would be useless since the files can’t be converted into GIFs or uploaded to YouTube, but they are useful if you’re trying to take a photograph of something that’s moving. After you shoot the clip, you can easily pick out one frame you like and use that as a picture. I also liked Zoes because if you use the Gallery app on the HTC One, you can have the phone grab all your files from one day or one album and turn them into a short 30-second montage of pictures, videos and Zoes that include music. Just like a video / photo montage. You can show that to your friends on your phone or share that in a variety of ways, including on YouTube. Zoes don’t work well with automatic photo upload features like Dropbox though, as it would just clog up your bandwidth uploading ALL the photo grabs + videos, so it would be wise to turn it off. On the left is a photo taken with my Samsung Galaxy S3, and the right is the HTC One. Notwithstanding that the S3 is one year old, the HTC One indoor performance is impressive and able to capture the image with less noise and overall better colour representation. Sorry, no S4 comparison pictures to do a side by side comparison. There are more photos of the HTC One in action below. Day performance photos are nothing extraodinary and would compare with other mobile phone cameras like the iPhone 5, or S3 / S4. The low light capability of the HTC One is somewhat better, and that is actually the area of more popular use. Lastly, for a more indepth look at the camera, you can also check out DPreview of the HTC One here.